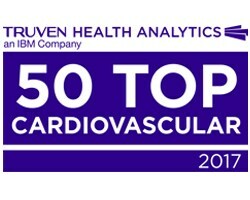 Banner Heart Hospital and Banner Boswell Medical Center have been named two of the nation’s 50 Top Cardiovascular Hospitals for 2017 by Truven Health Analytics, an IBM company. Both Banner Boswell and Banner Heart have been recognized through the years for their superior care and treatment of heart patients, and have recently invested in a number of important enhancements including state-of-the-art surgical suites and transcatheter aortic valve replacement surgery. This marks Banner Heart’s seventh year receiving designation as one of the nation’s 50 Top Cardiovascular Hospitals. Banner Heart Hospital is a 111-bed Cardiac Specialty Hospital, located in east Mesa, Ariz., a large suburban community near Phoenix. Ranked a Top Hospital in metro Phoenix for heart care and heart surgery by U.S. News & World Report, Banner Heart Hospital opened in November 2000 to serve the cardiac care needs of patients in the East Valley. BHH is now the second largest free-standing heart hospital in the nation. First-class physicians working with an experienced staff provide the latest heart care technology in an environment of clinical excellence, compassion and healing. In addition to telemetry and intensive care services, this state-of-the-art facility also has six dedicated operating room suites(two that are hybrid OR's), six cardiac catheterization labs and two electrophysiology labs. The facility employs more than 500 health care professionals, who specialize in heart care. More than 200 volunteers give their time at this facility, as well. The hospital has a growing medical staff of nearly 450 including cardiologists, cardiovascular and vascular surgeons, and other primary care and specialty physicians. Mesa, Arizona | Founded in 1878 by Mormon pioneers, the city of Mesa was built on a plateau overlooking an expansive valley. The word mesa has it origins in the Spanish language and its literal translation is "table top." The city is located just 15 miles from Phoenix and is home to more than 430,000 people. The city has numerous historic areas including the Temple District. This area of town surrounds the Latter Day Saints (LDS or Mormon) Temple, which was built in 1927. The temple and its visitor's center attract more than two million visitors each year.